In the midst of the white mist, two fragmentary star marks continued to emanate dazzling starlight, making it look like Nie Tian had channeled two ancient stars from the depths of the starry river. Su Lin, however, spewed out a mouthful of blood and stumbled backwards with astonishment filling her face upon the explosion of her purple, glowing sphere. Of everyone present, she was the one who had the deepest understanding of Nie Tian’s formidable strength. Their previous battle in the Ancient Fragmentary Star Palace had made her realize how powerful Nie Tian had been. As a matter of fact, all these years after that, whenever she had thought about Nie Tian, she had compared him with Ning Yang. She couldn’t help but think that if Ning Yang had been at the same cultivation stage as Nie Tian, he might not be able to beat Nie Tian in a battle. Deep down, she had already considered Nie Tian to be the most formidable of the younger generation of the Domain of the Falling Stars. Therefore, when she realized that the man before him was none other than Nie Tian, who had obtained all three fragmentary star marks and daringly turned down the Heaven Palace Sect’s offer, she rapidly made her decision that she would give up on the eighth grade black phoenix. Her purple, glowing sphere had exploded, and the illusory spell created by her silk cloth had been neutralized. That meant that her two most powerful spiritual tools had failed. Having made up her mind, she jumped out of the thick mist. With a grabbing motion, the piece of silk cloth flew back to her hand. Then, as light as a butterfly, she sped off into the distance. However, Su Lin completely ignored his call. She didn’t even turn her head back, but instead picked up her pace and disappeared into the distance. Her actions had made it clear that she had decided to back out of the contest for the eighth grade black phoenix’s corpse. However, Guan Ye, who possessed a higher cultivation base than her, didn’t plan to do the same. With a furious roar, he suddenly pounced towards Dong Li with his Heaven Profound Mirror in hand. Apparently, he planned to kill Dong Li first to enrage Nie Tian, then when Nie Tian lost his clear mind from the rage, he would have better opportunities to kill him. He forgot about Su Lin and the Earthshatter Beast’s eye, and instantly launched a Starshift. In the next moment, he appeared before Guan Ye, blocking his path in midair. With a force of ten thousand kilos, he slammed the Flame Star down on Guan Ye’s Heaven Profound Mirror. Three visible cracks instantly spread across the Heaven Profound Mirror, as if it could break at any moment. Then, with his empty hand, Nie Tian made a fist like a metal hammer, infused it with his heart-brimming anger, and drove it into Guan Ye’s chest. At the same time, the chaotic magnetic field he had surrounded himself with twisted Guan Ye’s spiritual sea. Adding in the fact that Nie Tian’s Rage Punch came too abruptly, Guan Ye only managed to gather a limited amount of spiritual power to form a faint defensive ward around him. Nie Tian’s fist bombarded the ward, his whole arm covered in bulging veins, as if the strike carried the wrath and unbending spirit of a titan. Immediately afterwards, the faint spiritual power ward exploded like an eggshell. However, the might of the punch didn’t wear off. It went straight into Guan Ye’s chest, breaking multiple ribs, and causing blood to spill from his mouth. Wood power rapidly morphed into a small tree that glowed with green light. Then, as it madly devoured Guan Ye’s flesh power, it spread at an alarming speed. Before Guan Ye could do anything, the new thorns pierced through his heart and killed him. With the Flame Star in his other hand, Nie Tian penetrated Guan Ye’s chest and pinned him to the ground in the middle of the other corpses he had put there. Nie Tian suddenly spun around in midair and shot towards those from the Heaven Expanse Sect and Thunder Mountain Sect like a fierce devil. While sailing through the air, he made a grabbing motion, and the Flame Star flew back into his palm, dragging a tail of flames. The reason why they hadn’t dared to make any moves after coming to this place was because they had noticed the corpses lying around Nie Tian. At first, they hadn’t been sure who had killed those people. None of them had known who Nie Tian was, much less his actual battle prowess. They had only assumed that different parties had engaged in fierce battles over the eighth grade black phoenix, and Nie Tian had happened to be there when everyone killed each other. After all, Nie Tian was only at the middle Greater Heaven stage. None of them had thought these people’s deaths were his doing. Later, when a battle broke out between Nie Tian and Su Lin and Guan Ye, they had felt that they might as well obtain a better understanding of Nie Tian’s strength through their battle. To their surprise, Nie Tian’s actual battle prowess was far beyond his cultivation base. Then, when Su Lin had exclaimed Nie Tian’s name and left with a panicked expression, it had come as a shock to them. Afterwards, when Nie Tian had slain Guan Ye before them and added him to his ‘collection’, they had been shocked to their core. Now, they were briefly bewildered to see Nie Tian pounce towards them like a sinister devil. They hesitated over whether they should stay and fight Nie Tian over the eighth grade black phoenix’s corpse, or if they should leave like Su Lin had. While they were hesitating, with another short-range Starshift, Nie Tian vanished from their sight. The three from the Heaven Expanse Sect and the Thunder Mountain Sect had an expression that was as if they had seen a ghost in broad daylight. In haste, they formed defensive wards around them with spiritual power. They had just witnessed how Nie Tian had suddenly vanished and reappeared within arm’s reach from Guan Ye, and killed him. They naturally assumed that Nie Tian was using the same technique on them. However, Nie Tian didn’t reappear before them right away this time. While they were puzzled, they discovered that Nie Tian had already appeared about ten meters behind them, holding his hand out with palm facing up. As they all turned around, they discovered that countless wisps of pure spiritual energy were rapidly converging on Nie Tian’s palm from all directions, forming a spiritual energy ball. The continent they were on was filled with rich spiritual Qi of Heaven and Earth, many times richer than in the Domain of the Falling Stars. As Nie Tian formed the spiritual energy ball, he discovered, to his surprise, that the spiritual Qi of Heaven and Earth in this place was laced with mysterious energy from the gray mist that filled the entire sky. The spiritual energy ball was grayish-brown, with shadows flashing about in it, giving rise to fluctuations he wasn’t familiar with. With a thought, the grayish-brown spiritual energy ball shot out of his palm towards the three Qi warriors from the Heaven Expanse Sect and the Thunder Mountain Sect. The three of them, who had already stimulated the power of their spiritual armor, were stunned to see the spiritual energy ball shoot towards them at lightning speed. In the next moment, the spiritual energy ball exploded violently. As a force that could tear all things to shreds burst forth, the three Heaven Expanse Sect and Thunder Mountain Sect disciples’ defenses were all eliminated within a split second. Immediately afterwards, the tearing force instantly engulfed the three of them. Then, Yang Kan and Lu Jian watched them turn into a bloody mess, as if their flesh was being cut from their bones by a thousand blades. Even though two of them were at the middle Greater Heaven stage while the other was at the early Greater Heaven stage, they lost their lives the moment the spiritual energy ball exploded, not even having a chance to make a move. He also hadn’t expected that the spiritual energy ball he had formed with the spiritual Qi of Heaven and Earth in this place would turn out to be so destructive. He only knew that unknown energy from the gray mist that filled the entire sky had been channeled into the spiritual energy ball when he had formed it. That mysterious energy seemed to carry an aura that could shred everything in heaven and earth. Perhaps it was the true cause of the bloody scene. Nie Tian jerked his head up to look at the gray mist that stretched as far as the eye could see, absorbed in thought. “Big Brother Yang!” Lu Jian exclaimed in a low voice. Yang Kan’s expression was especially grim, and his temples throbbed nonstop as he stared blankly at Nie Tian. He, who had been looking for opportunities to strike, felt nothing but bitterness. He had expected that, after entering the middle Greater Heaven stage, Nie Tian’s strength must have risen significantly, but he had never expected such devastating strength! With these words, he didn’t want to stay a moment longer. Like a streak of flames, he dashed into the distance. Screaming for his life, Lu Jian sped after him. Tale: During the Warring States Period (475–221 B.C. ), there was a minister in the state of Chu named Zhuang Xin. Zhuang worried when he saw the court officials and the king often indulging in luxuries and excessive pleasures. One day, Zhuang said to the king of Chu: “Your Majesty, you are always surrounded by ministers who flatter you and try everything to make you happy. You have no time to take care of state affairs and Chu is facing great danger. If no change is made, our state will certainly perish.” Hearing these words, the king was unhappy and scolded him: “How dare you! You would use such vicious words to curse my country and try to arouse the people’s anger!” Realizing nothing was going to change, Zhuang asked the king for permission to leave the state for a time. The king allowed it and Zhuang went to the state of Zhao. A few months later, an army from the Qin state invaded Chu and occupied a large tract of Chu territory. The king of Chu was forced into exile. It was not until then that the Chu king remembered Zhuang’s advice and felt regret for not listening to Zhuang. He sent his men to call Zhuang back. Having a strong sense of commitment to the state of Chu, Zhuang immediately went back to his king. “What can I do now?” asked the king. 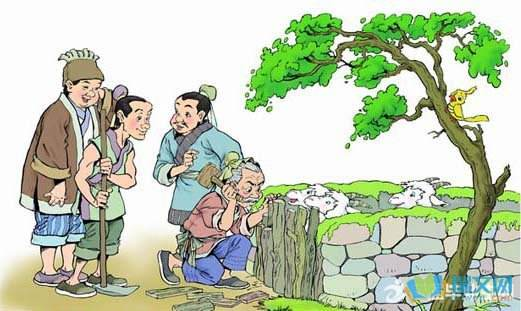 Zhuang answered: “Once upon a time, a shepherd found a hole in the sheepfold, but he neglected to repair it. A few days later, several sheep were missing. He then mended the pen. After that, he never lost sheep again. It’s not too late if you mend the sheepfold even after a sheep is missing, your Majesty!” With the help of Zhuang’s advice on how to restore Chu, the king finally recovered the lost territory. The idiom is usually used to advise someone that it is never too late to take steps to correct mistakes and prevent further losses.